If you have any questions or suggestions you are welcome to join our forum discussion about Further Talk on Trending Ranges in Stock Trading . 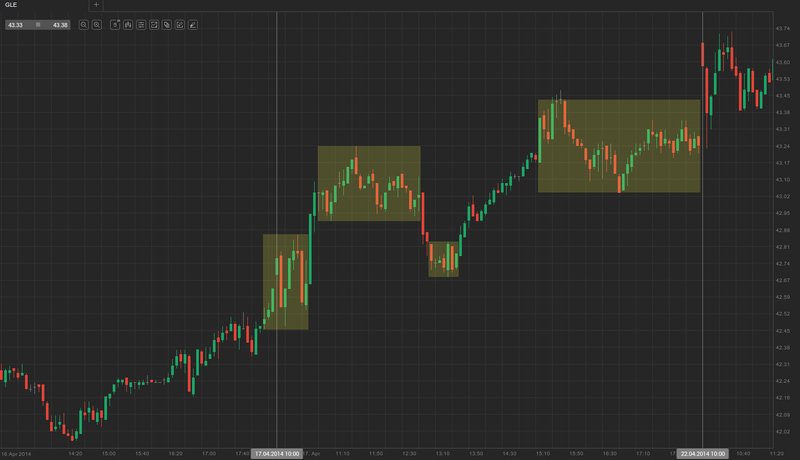 Sometimes the trend’s components (the trading ranges) are not so easily defined. A general rule of thumb is that if the market is trending in a direction (forming trending highs and lows), but the trend is not easily enough spotted, then you usually have a trending trade range day. Trending range days warn you in advance that a breakout should be expected. Even as the market holds in a certain range, as soon as it begins to form trending highs and lows, it is a matter of time for the majority of market players to recognize this and position themselves accordingly, which will lead to a breakout. However, it is not always the case that the day’s initial trading range, which matches the description noted above, will break out and perform a measured move, trying to reach the average daily range. In around 30% of the time, a breakout from the range will reverse back and break out of the range’s opposite side and extend the range. By growing the daily range to near or above the average, this commonly leads to a calm range trading day and not a trending range day. 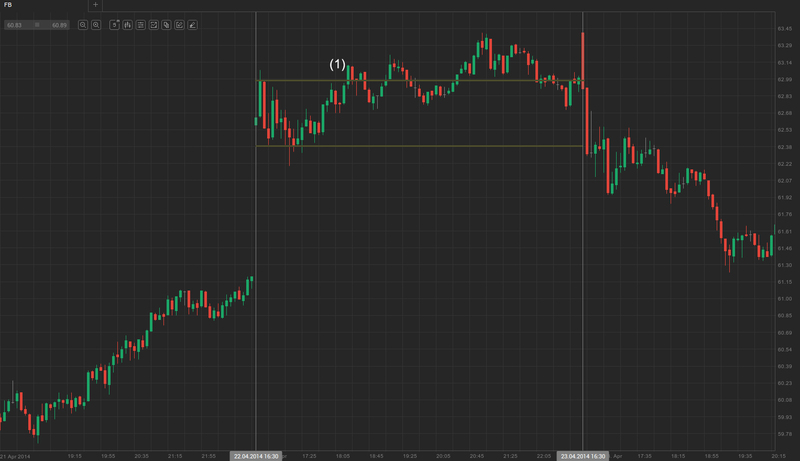 As you can see on the example shown above, there was a breakout through the bottom of the day’s initial trading range to a new daily low, before which the range was about a half of the average daily range. After the breakout, the price attempted to edge lower two more times, but since there wasn’t enough selling pressure, it rebounded up to test the range’s top boundary. It broke out above the initial trading range at (1), further growing the day’s average range, before returning into the trading range. 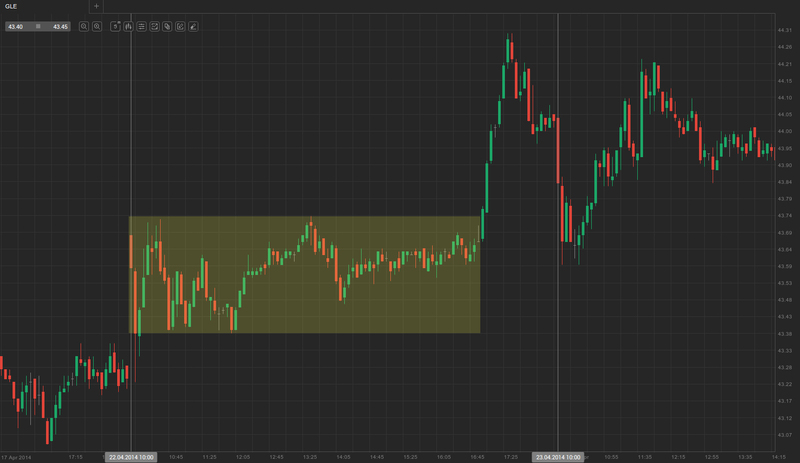 A second new daily high was formed later, followed by a pullback into the trading range, and then a third daily high was reached, before the price pulled back. During the final trading hour of the day, the market found itself within the same initial trading range, only to settle several cents higher after a two-bar reversal. Typically, because there is no agreement on market direction during the day’s initial trading range, and there are a number of entry possibilities, it doesn’t matter whether you will go long or short. When trying to determine your profit target, you should start with a smaller profit aim, and if the market does not pause within that area, you can go for a wider target etc. Another peculiarity of the trending range days is that due to the sideways trading that has dominated the entire session, the market is often observed to reverse through at least one of the trading ranges in the last two hours of the day. This is due to the trading ranges’ vacuum effect. Such a scenario is visualized on the screenshot below. 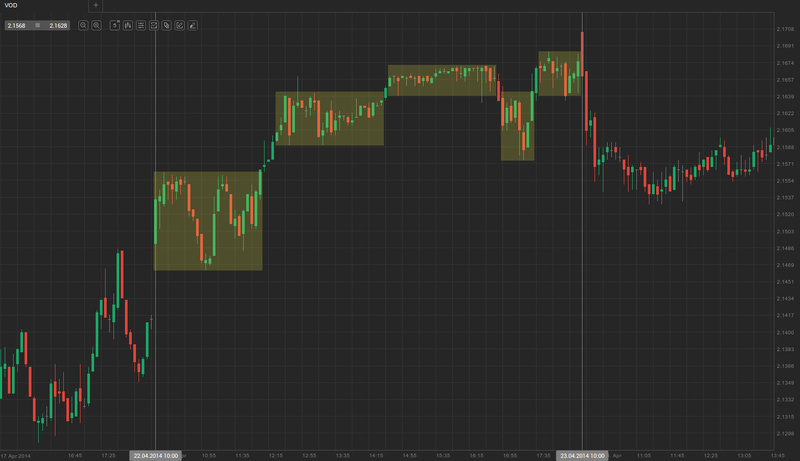 Also observed sometimes, the initial trading range continues throughout most of the day, although it displays signs of a typical opening trading range during a trending range day, and the breakout doesn’t come up until the closing hour or two. Although there might not be enough time for the market to enter a higher/lower range, it still fulfills the breakout setup into a trending range day that has been awaited by market players. Check out the following screenshot. Because the market kept in a trading range about a half of the recent days’ average price fluctuation, traders expected a breakout up or down to eventually occur. The price tested the bottom of the trading range, including a couple of undershoots, after which it rebounded towards the upper half of the average range. There was a large number of bull bars as bulls exerted buying pressure, suggesting an upward breakout from the range was likely. Sometimes however, as the market breaks out from a trading range in the final hours of the session, it might enter a trading range, which is continued on the next day. As the next trading day begins, it might become a trending range day, whose initial trading range is partially or fully formed in the day before. Such a scenario is pictured in the example below.